If you do it for long enough, like I did, you may end up with a disorientated internal navigational system – that perhaps, may be likened to a ‘Compass With No Needle’. From the age of 16, I became obsessed with finding the ‘truth’ within me. – the result? I began to place my thoughts, truths and opinions into as few words as possible, so I could recall them easily and re-evaluate them…often. Yes, obsessed. I kept this process and my writings a secret for more than 20 years. However, a few years ago I took my writings to a trusted and loved friend (who is a brilliant writer; R. I. Sutton – check out her website) who informed me that I am a writer of ‘Aphorisms’. So there you have it. My distortion is now my art form. Hmmm… could we assume the same with most artists I wonder? Having summed up my writing for you, I’ll now tell you about my painting; painting was a fear I confronted in 2001. At the time, not much scared me more than the idea of painting. I began by receiving tutoring from Jan Pagram in Pastels where I learned to achieve an effect close to photo realism. I then went on to study, in theory only, Oil Painting under Lance McNeil. The McNeil Academy follows the purest method passed down from the Old Masters – Lance would cringe if he were to see my works! ‘Abstraction is pure folly!’ – I can just hear him now. Of course, I didn’t disclose to my teacher how I intended to use the tools he was teaching me. I chose this method of study because I wanted to purely learn the tools with which to create – nothing more. This style of study suited me, as it allowed me the ‘untouched head space’ to create from – sounds terribly arrogant doesn’t it? But, to be honest, I never excelled within the class room, so I chose not to subject myself to more of that kind of failing. My aphorisms are the inspiration behind my paintings. I use charcoal and water on canvas – if you are a visual artist, you will know that charcoal and water don’t mix. I love the conundrum in this fact. I really love to lose lines – dark into dark, light into light. I tend to have a slight obsession with my painting process too – the canvas must be beaten and scratched before I will create on it. My core belief here is – unless the canvas has gone through some sh*t, then it is unworthy to hold an opinion – and that’s what I do; I paint my opinion. For whatever reason, I used to create only one work every three years; without even a sketch in between – what a naughty artist! The first charcoal on canvas I created was ‘Compass With No Needle‘, followed by ‘Repulsion In Red‘, and finally ‘Right Breast Assault‘ – completing the series on abuse – finally. You can view them from the ‘Paintings‘ category. I have just begun my new series about Consumerism. I am pleased to announce that it has only been seven months since my last work – rather than three years. I may become prolific yet… I hope. 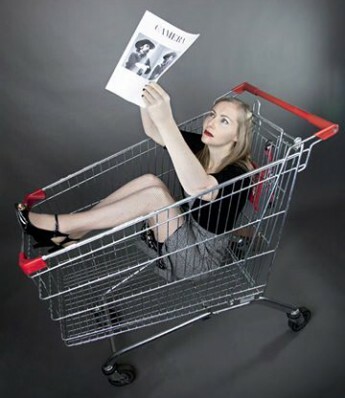 I have placed one of my reference photo’s from a recent photo-shoot, as my header picture – you will spy me reclining inside a Shopping Trolley. Hello to you too 100words; Kindred spirits may be true – the three of us strive to say much – with less. Have you considered posting your art work? HOW HAVE YOU BEEN, KELLY,…..ok,…now where do i go to see you pictures again??? what i mean is,….are there just the two pix here now? Hi johnedoe 🙂 I’ve been well thanks. …yep… still just the two pics – I have REALLY got to get onto that, don’t I?! It’s such a great thing that people ARE interested – now I just have to shake opportunity’s hand with a firm grip, and take and post those pictures. Thank you Subhan 🙂 for valueing this journey with your kind words, ‘likes’ and your follow. I would like to thank you for following my blog. I hope I don’t disappoint you and that your visits in my blog have been and will always be a joyful ride. Love love love all of this! Really inspired by your use of words. The ability to ask so many deep questions with so few words is an amazing and rare talent. That’s how your mind works. Wedges itself in one full blow between the pretty little niceties we adorn ourselves with and the harsh abandoned deepnesses we spend our whole lives running from. Like a fly meets its death. In one swift final motion. I love the way your brain creates, and love it more for sharing. I relate to you, ps. Hi Kelly. What an absolute joy I had today in discovering you and your blog. For the first time in I don’t know how long, I found myself wishing there was something to click on that was a higher rating than Like! Your thoughts and words have such a Universal message and they resonate in the hearts of all who are awake. I am truly looking forward to all my return visits. Namaste, and many thanks for all your share and for the difference you are making. Thank you so much rickbraveheart for your generous comment – it feels so good to get the feedback you have just given! Regarding ‘My distortion is my art form’ you are in good company. Edith Piaf said “Use your faults, use your defects; then you’re going to be a star.” Great blog. I think Edith was onto something there. Thanks for your great comment Jenny. Hi Sandy, thank you 🙂 I’ve been well – I’ve had less access to the computer of late, hopefully now I will be a reliable blogger and blog visitor again. Thank-you for liking my beach shots. Cool blog. What is your tagline going to be? I had ‘just another…’ too for the longest time before I worked out I could personalise it! 🙂 Can’t remember exactly how I did that now, but it’s in the dashboard somewhere. Tagline? hmmm, not sure how to change it. Thanks for bringing it to my attention – I shall explore. Kelly, I’ve nominated you for the 2012 Blog of the Year Award @ http://davidkanigan.com/2012/12/08/blog-of-the-year/#more-13084. You are under no obligation to accept. I just wanted to take this opportunity to thank you for your inspirational posts and your friendship in 2012. Thank you Dave for your recognition, and kind words. I’ve loved visiting your blog, and I am very grateful that you visit mine. Hey, thanks for the acknowledgement – I’m alot surprised that I may of inspired this. Once again you have informed with your blog – you’re a very clever lady. It appears that your enthusiasm for art is abundant. Keep doing what you’re doing; there are too many that fall victim to personal resistance, and not follow through with their true passion. Resistance has the ability to rationalize and give us great reasons not to follow our dreams, but it is in the artist, the true artist, that knows, life is a constant creation. Keep creating. It is a constant battle, against self, that I fight in order to put charcoal to canvas. I finally did some more work today – on that ‘third piece’ that I referred to in this post – this post that was written in 2011! Any way… the point is, I did it – I worked. I need to do it. My art informs me. Thank you for your encouragement WB. 🙂 This is an area close to my heart. These a great Ben! Are you the author? I’m asking because there are no names associated with the aphorisms. I’m delighted to tour your free and expansive mind — happy to connect with deep thoughtful-hearted people like you. Indeed, it lightens the spirit. Your story interlaces with mine. Like you, aphorisms came to mind and as I recorded each one they helped me remove the anxiety, dread and despair. I experienced cleansing, clarity and release in a way I had never anticipated. All my own endeavors were futile in comparison. It’s been amazingly healthy and healing. It’s interesting that it has had a similar affect on you too. Thanks for sharing Vincent 😀 nice to know that I’m not alone in this! from Costa Rica to Australia! Blessings to you and yours. Hello Kelly! I’ve nominated your blog for The Clements Award for Outstanding Blog. No hassles and no strings attached. You don’t even have to do anything but simply to continue with what your are great at doing which is writing. Here’s what this award is all about: http://midsommereve.wordpress.com/2013/01/12/just-because-a-new-award/ and here’s where I thought of you when i conferred it: http://junsjazzimages.wordpress.com/2013/01/14/an-award-to-start-the-week/ Congratulations! Cool question 🙂 I still see beauty, and I still look for colour within colour and delight in it. I think that the reason (I love that we cannot even be definite about ourselves…), and I’ve come up with a few thoughts on the ‘why’, is that perhaps at that particular time in my life I was trying really hard at everything. Marriage, motherhood, church, friendship – everything. When my marriage dissolved into reality after he physically left – reality became my anchor. I became more of my focus, and my paintings changed. Perfect, beautiful, surface, realism lost my interest; imperfect, ugly, deep, marred work became my focus. People now dominate my work. Their body language communicates my opinion – and it feels right. I love it! Thank you for asking bw, I love a good question. Any other imagined compliment could not have touched me as deeply, as your words just did. We could debate consciousness, identity, ego and creativity (not to mention “copyright” 😛 ) till the cows come home, but where would that take us? Ideas, images arise in my field of awareness, I write them down. Perhaps others read them. I am not at this stage it seems. I get very cross when an author gets separated from their work. And because you hold this loosely for your own writing – I am all the more impressed that you make note of the author, when it is not you. I’ve been enjoying your aphorisms and I love your words–“my distortion is my art form.” Very powerful. Thanks for stopping by…I’ve bookmarked your place so I can be inspired at my leisure. Lovely 🙂 thank you jules! Aww, that’s a nice thing to say. HI KH – nice blog! Obviously, I needed your perspective on this – I was ignorant to how my abuse was effecting others! I may need to get help though – the urge to whack that canvas is just so strong! I also understand that urge – have you contacted AAA (Art Abusers Anonymous) yet? The first step is admitting you have the problem – well done! What you’ve written about laughter is good; and true. I also read somewhere that it is our brain receiving a fright. Haha 🙂 Well, you do deserve it 🙂 Happy blogging! I love your aphorisms – i read one, then the next, then the next – they are awesome and though ‘little’ packages, they carry quite a bit of thought, feeling, a punch! I Iike you! Like Nina, I too, had some moments reflecting as I read your “aphorisms”. You have a beautiful way with words. I love it that you had moments of reflection while reading them – I was hoping for that; hence why I share them 🙂 Thanks Arley! Thank you so much for reblogging it! I am so touched to be considered part of you WP family, Kimberly! It’s a great award Shaun 🙂 Lovely sentiment. Good read, and a good story of your life. Thank you so much, Kimberly!!!! For history of and clarity on aphorisms, try James Geary’s book “The World in a Phrase.” Very best to you in all your creative endeavors. Interesting; the internet had introduced me to James Geary’s book a few weeks ago… a coincidence? Thanks for visiting, love the profile pic! The pic was taken as a guide for a painting I’m currently working on about consumerism.